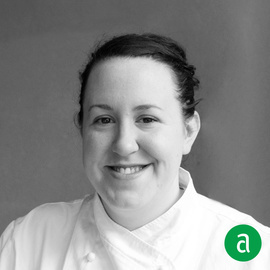 Anna McGorman, Director of Culinary Operations of Momofuku Milk Bar in New York City, shares her career timeline and words of advice for up-and-coming professionals. I keep my team motivated by treating them with the respect I like to be treated with. I also keep a 365 Puppy calendar in our station. It’s the little things that keep people sane. It’s the tiny, thoughtful gestures that builds the house. It’s not about where you worked before, it’s who you are as a person and I only hire people that I think will add to that. Positivity. My mother used to always preach attitude versus aptitude. If someone is unwilling to learn, be humble and to work with other people, they will never survive in this business. We all rely on each other. No one can do it all. I hire for attitude, and people that want to learn and look at each as an opportunity rather than a challenge. There is a lot of repetition in our industry and I’m always looking for that fire and drive to embrace each day as a new experience. A deep love of 90s Hip Hop and R&B is always a bonus! I cannot work without my tiny pocket scissors! They save so much time-- and they are very sharp. “On Food and Cooking “- To cook with product and manipulate it, you have to understand it. Especially in pastry, lack of understanding is a huge disservice. I find inspiration everywhere. It’s less about looking at a particular source, but more about distilling a vibe. Try breaking down the recipe and see what memories or emotions it evokes for you. For example, how do you take pumpkin pie and think about what memories and feelings it brings back. Then how you do rethink the recipe to evoke those same feelings for your guests? If it gives someone a whisper of that feeling, then we did our job! Going out to eat is very important because it allows you to see what other chefs are doing and helps you to keep up with the trends. You never want to isolate yourself either, so travel to other places outside of NYC--it will help push you out of your comfort zone. It’s not always looking at the now, but also about looking back and appreciating where we have come from. Open Escoffier’s “Le Guide Culinaire,” there is a fountain of knowledge and inspiration in those pages despite their age. You can’t really know where you’re going if you don’t know where you’ve been.